Belated birthday treat from one of my good friends. At his request, mainly because he had a 1 for 1 voucher from one of the banks, we went to Spizza. It seems that the diners next to us also had a 1 for 1 voucher issued by another bank. I’ve always liked pizzas from Spizza. Their pizzas are the thin and floppy type (“wood-fired thin crusted Napoli pizzas”), oozing with delicious goodness from the toppings. None of the crispy pizza base types for me thank you. It’s so dumb that the Spizza outlet at HarbourFront closed and Pizza Hut took over instead. Can you believe the irony? Anyway Spizza is still available at Club Street, Bukit Timah and Jalan Kayu. I like the Club Street branch since it’s been there the longest, it was the 1st outlet, and it’s located near the Ann Siang Hill/Club Street area which is very nice for a stroll after dinner. Did you know that Spizza has an island-wide delivery? I just discovered that fact like 5 seconds ago. Might call for some when I’m feeling the craving! All the pizzas cost $17 for medium size and $21 for large. For ladies, a medium would be more than enough. Between the 2 of us, we ordered 2 medium pizzas plus a calamari. 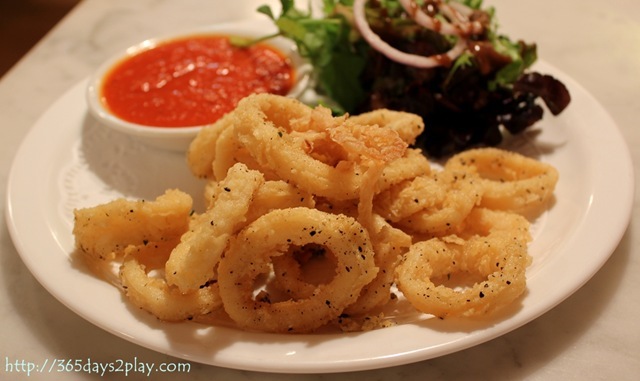 Crispy Calamari with Pizzaiola Sauce $11 – This was pretty good. They came out hot, which is a must, and the batter was crispy and fresh. 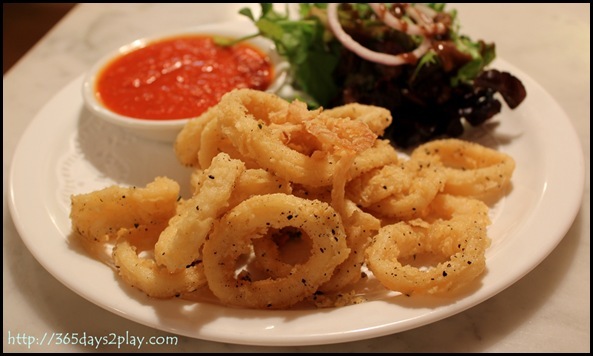 There were also bits of crispy onions as well, which lent extra sweetness to the calamari. Delicious! 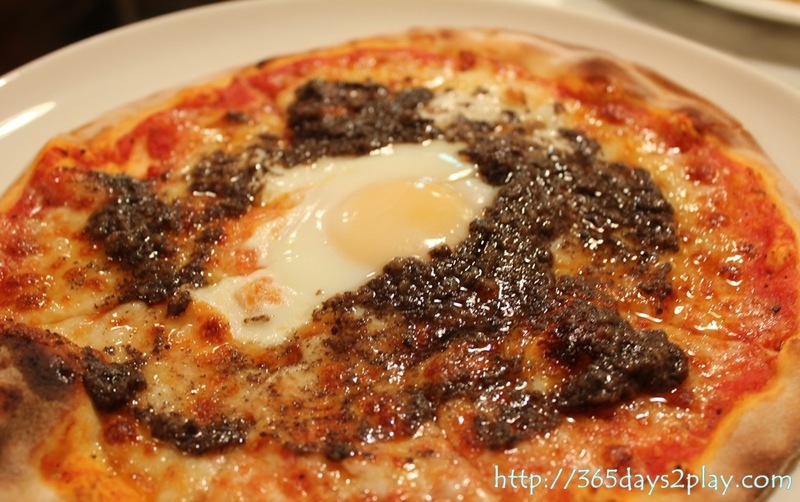 Quinta: Tomato, Mozzarella, Egg, Black Truffle Sauce $17 – This was so so so so SO delicious. If you are lost as to which pizza to choose, I would highly recommend the Quinta. 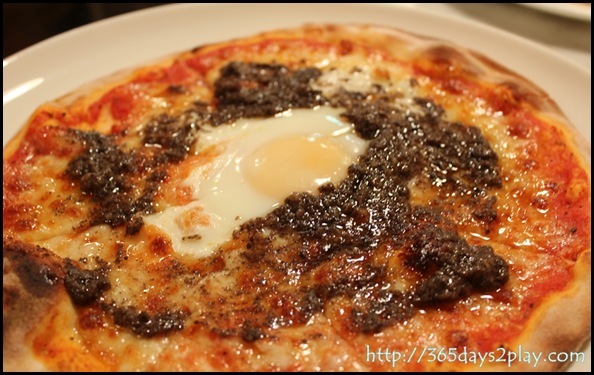 The black truffle sauce really adds an unmistakable dimension to pizza. I’ve never seen so much truffle before too. And the egg. Ohhh…dip each pizza slice into the runny egg yolk. It is heavenly beyond compare!!! My friend had never tried truffle before, at least not consciously. He was immediately hooked on this, despite the initial pungent smell. 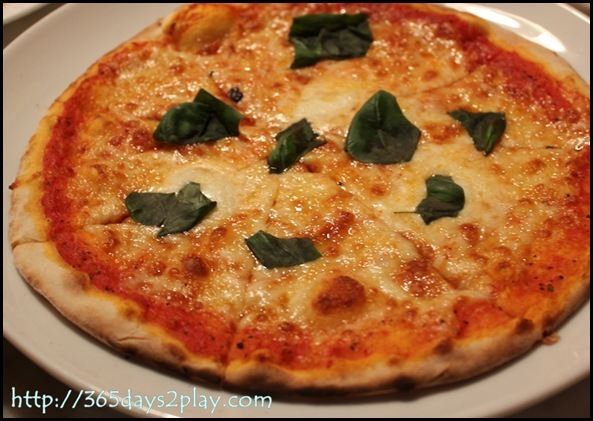 Margherita: Tomato, Buffalo Milk Mozzarella, Fresh Basil $17 – After the explosion of flavours from the 1st pizza, this one kind of brought us back down to earth. I am a huge fan of buffalo milk mozzarella. 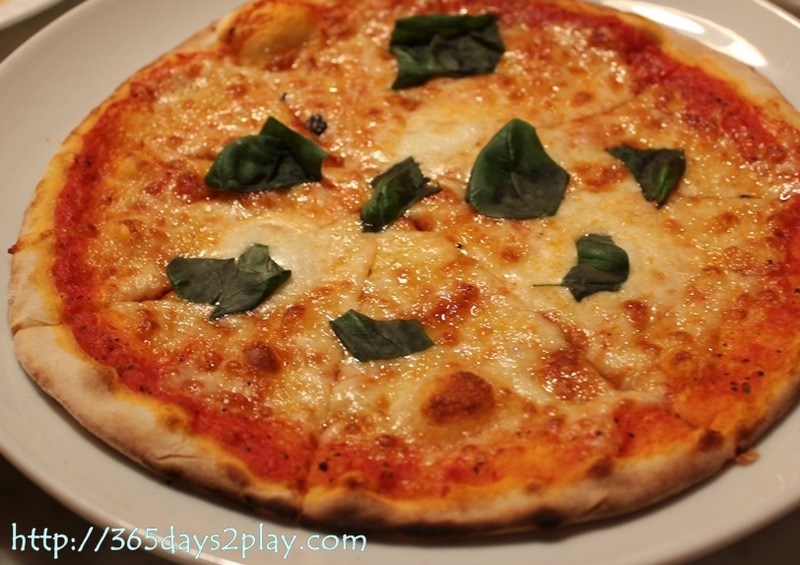 I love caprese, so I wanted to see if pizza with mozzarella slices would be nice too. I was kind of imagining that the cheese would still be thick chunks laid out on the pizza, but it was baked as well. So this pizza felt pretty plain, no thanks to us having eaten Quinta first. It’s not a bad pizza, but if you want more ingredients, or you want the taste of the buffalo milk mozzarella to be stronger, don’t order this pizza. Standard Chartered is also offering 15% discount for card holders, 20% if you have the Standard Chartered Visa Infinite Dining Privilege. Students also get 15% discount! And if you dine at Spizza often, you can get their loyalty card too. yummmm calamari! I haven’t been to Spizza in a while. I think the last time was the Jalan Kayu branch. The branches I used to go to at HarbourFront and Killeney Road closed down! Luckily the Club Street one is still there cuz the Jalan Kayu and the Bukit Timah ones are too far for me.